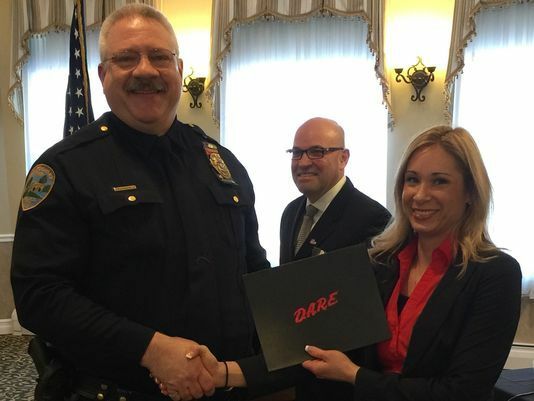 Montgomery Police Officer Bruce Heddy receives his D.A.R.E. Officer certification from his training mentor, Officer Kate Proscia of the Branchburg Police Department. In the background is Rafael Morales of D.A.R.E. America. 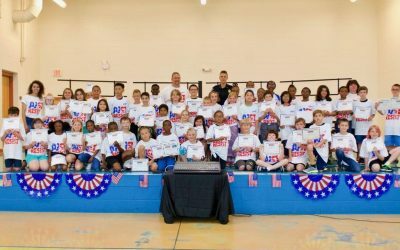 MONTGOMERY – For a generation of school kids in fifth and sixth grades, Drug Abuse Resistance Education (D.A.R.E.) was a gateway program created to combat rising drug use in the 1980s. By bringing police officers into the classroom at a critical time before kids reached the temptations of adolescence, the lessons of how to deal with the pressures of drug and alcohol use and bullying were delivered to still-impressionable minds. 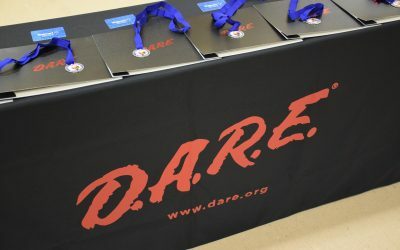 DARE was popular and successful, but like many programs not at the core of the curriculum, D.A.R.E. began to vanish from schools as budget cutbacks forced difficult decisions. 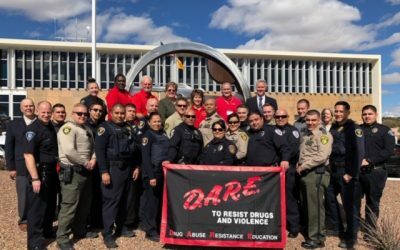 But now, with the nation on edge because of school shootings and the rising use of opioids, there may be no better time to revive the D.A.R.E. program. That’s one reason Capt. 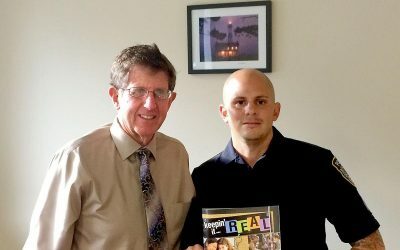 Thomas Wain, the township’s police director, sent two of the department’s officers — Bruce Heddy and Sean Devlin — to an intensive, 80-hour D.A.R.E. officer training course in March at the Somerville Elks in Bridgewater. Twenty-five police officers from throughout New Jersey (including Watchung, Warren, Bernardsville, South Amboy, Plainsboro and the Middlesex County Sheriff’s Department) along with officers from Virginia, Pennsylvania, Massachusetts, Vermont and the U.S. Coast Guard in Kodiak, Alaska, graduated from the course taught by a D.A.R.E. America educator from New York state, a facilitator from Connecticut and specially trained veteran D.A.R.E. officers from Maryland and New Jersey. For Wain, who once was a D.A.R.E. officer in Montgomery schools, it was an easy decision to send the officers to the training. The lessons the kids learn in D.A.R.E. last a lifetime, Wain said, adding that he has maintained “lifelong relationships” from classes he taught two decades ago. In fact, one of the graduates from the D.A.R.E. training, Officer Alex Mann of the Bernardsville Police Department, remembered Wain from a D.A.R.E. class. “It’s come full circle,” Wain said. 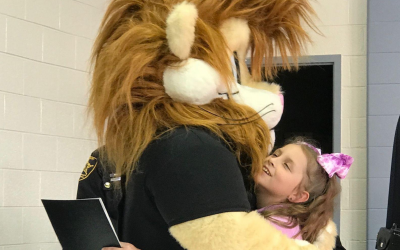 The primary goal of D.A.R.E., Wain said, is to establish a trusting and lasting relationship between the kids and police officers so that as the students grow, they will believe that they can go to a police officer with a problem or report suspicious activity. At a time when anxiety is high about school violence, that trusting relationship, established in what Wain said is a “non-confrontational setting,” may be a key to preventing a tragedy if kids realize they can tell police about suspicious behavior. Wain’s experience as a D.A.R.E. officer led him to becoming more immersed in Montgomery schools, from attending plays and concerts to coaching varsity softball. Exactly how the new D.A.R.E. officers will be used in schools is still to be decided between the police department and the school district, Wain said. 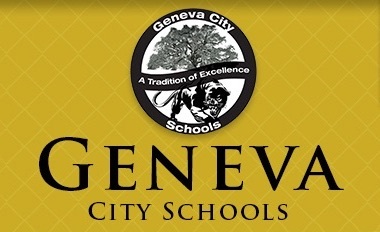 The school district was undergoing a security audit starting March 26 and the results will be released later this spring. Sending the police officers to D.A.R.E. training had the support of the Township Committee. 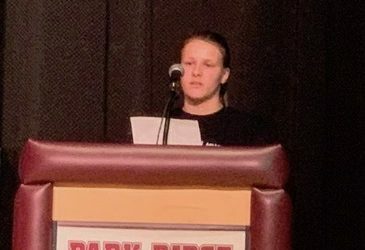 800 New Brunswick Students Say “NO” to Drugs through D.A.R.E.